People stand behind a tesla motors cars engin during the 1.618 sustainable luxury fair, both a professional exhibit and cultural event, on May 15, 2009 at the Palais de Tokyo in Paris. My colleague Will Oremus thinks Elon Musk has just made his first big mistake with Tesla, by choosing to go ahead with efforts to develop “autopilot” technology rather than maintaining a single-minded focus on developing a more affordable car. I think there’s a mistake here, but not necessarily the one Oremus is worried about. Perhaps there’s a tradeoff between having engineers work on better/cheaper batter manufacturing and having engineers work on car automation, but it’s not obvious to me that’s the case. The problem here is that Tesla is setting its sights too low, focusing on computer-enhanced driving rather than true autonomous vehicles. This strikes me as a betrayal of what’s made the company succeed so far. 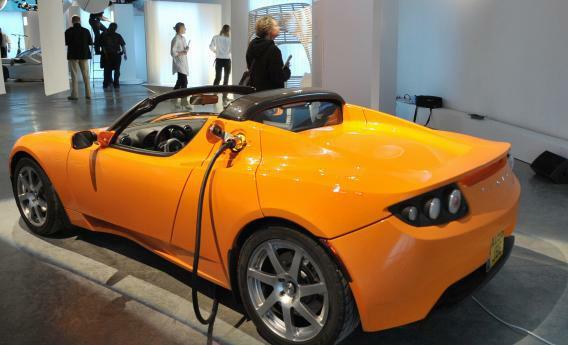 While others were content to make cars that were kinda lame, but also kinda expensive, and then try to guilt people into buying them because they were electric Tesla set out to build a really great electric car. That turns out to have meant a really expensive car that only rich people can buy. But that’s okay! The luxury car market is a real business that lots of companies very legitimately play in. And it creates a foundation from which to try to work down and build more affordable options. But it’s that spirit of taking the aspirational moonshot rather than tinkering that paid off. But that remaining ten percent makes all the difference. With genuinely autonomous vehicles we can enter a utopian domain of ubiquitous super-cheap taxis that transforms the American landscape. With a really good autopilot mode, by contrast, all we have is marginally safer highways. Of particular note, genuinely autonomous vehicles would go a long way toward solving a lot of the affordability issues with electric cars. The main thing is that if instead of owning a car that you drive everywhere, you summoned an autonomous vehicle for a specific trip then suddenly it stops being a problem if most cars don’t have batteries that are big enough for long trips. Long trips, after all, are fairly rare. You could do your day-to-day commuting and shopping in cars with relatively rinky-dink batteries and then get a long-range vehicle on the rare occasions that you need one. Now obviously all this may never come to pass. Perhaps the technological problem is just too hard. But perhaps it isn’t! And if it isn’t, the company that solves it will have a huge edge. For a company to be working on car automation and not even aspiring for this kind of dramatic, transformational breakthrough is sad and seems contrary to what Tesla’s done so far.